Zhang Jiao is attempts to rekindle his faith in himself, as well as his follower's faith in him, as they set off for the "Promised Land". They avoid religious persecution by the Han Empire, and Zhang Jiao is constantly defending themselves from Han loyalists. 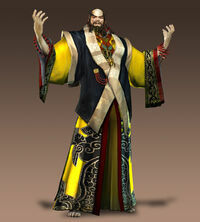 After they flee from He Jin's group, Zhang Jiao quells bandit uprisings started by men claiming to be Yellow Turbans. Regaining faith in himself, they defeat their pursuers, Yuan Shao and Liu Bei. They sail by sea to Jiang Dong, where they are offered shelter by Liu Biao. Unfortunately, Liu Biao's hospitality is only a guise; under the direction of Sun Jian, Liu Biao ambushes the Yellow Turban army at night and forces the pilgrims to flee once more; this time, Sun Jian is routed and Liu Biao is killed in their struggle.